Creating a Faery Figure with Wendy Froud will be released on December 13th, 2006 by Gnomon Workshop and shipped from Goblin Market (USPS Priority Mail) on December 18th. 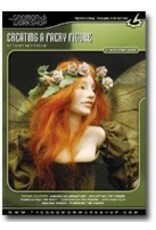 In this two-disc DVD workshop and the first for the artist, Wendy Froud explains and demonstrates how to create a faery figure. She begins with a guided visualization to help you access your imagination for unique designs. Wendy then shows how to properly build the armature and prepare the polymer clay, anticipating the various problems that may occur further into the process. From there, she sculpts the head, upper torso, hands and feet, determining the figureï¿½ï¿½_s proportions and gesture and explaining how to quickly add facial details with an array of tools. Next, Wendy shows how to fabricate the body and she shares her process for choosing materials for the costume and hair. Finally, she demonstrates painting, assembling the costume, creating the wings and adding hair, all while considering how to give the faery a personality of its own.